Pines are coniferous trees of the genus Pinus, in the family Pinaceae. As conifers, they are seed-bearing and thus vascular plants. Specifically, they are gymnosperms, meaning that the seeds are not formed in an ovule that is enclosed (and developing into a fruit, as in the other type of seed plants, the angiosperms), but naked on the scales of a cone or cone-like structure. There are about 115 species of pine. Pines are found naturally only in the Northern Hemisphere (with one very minor exception) where their forests dominate vast areas of land. They have been and continue to be very important to human beings, mainly for their wood and also for other products. Besides that their beauty offers an aesthetic quality and a source of inspiration to those living in the northern environments. There are some conifers growing in the Southern Hemisphere which, although not true pines, resemble them and are sometimes called pines; for instance the Norfolk Island Pine, Araucaria heterophylla, of the South Pacific. Pines are evergreen and resinous. Young trees are almost always conical in shape, with many small branches radiating out from a central trunk. In a forest, the lower branches may drop off because of lack of sunlight and older trees may develop a flattened crown. In some species and in some environments, mature trees can have a branching, twisted form (Dallimore 1966). The bark of most pines is thick and scaly, but some species have thin, flaking bark. Pines have four types of leaves. Seedlings begin with a whorl of 4-20 seed leaves (cotyledons), followed immediately by juvenile leaves on young plants, two to six centimeters (one to two inches) long, single, green or often blue-green, and arranged spirally on the shoot. These are replaced after six months to five years by scale leaves, similar to bud scales, small, brown and non-photosynthetic and are arranged like the juvenile leaves. The adult leaves or needles are green, bundled in clusters (fascicles) of (one to six) needles together, each fascicle produced from a small bud on a dwarf shoot in the axil of a scale leaf. These bud scales often remain on the fascicle as a basal sheath. The needles persist for between one and 40 years, depending on species. If a shoot is damaged (e.g. eaten by an animal), the needle fascicles just below the damage will generate a bud, which can then replace the lost growth. Pines are mostly monoecious, having the male and female cones on the same tree. 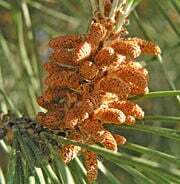 The male cones are small, typically one to five centimeters (0.4 to two inches) long, and only present for a short period (usually in spring, though autumn in a few pines), falling as soon as they have shed their pollen. The female cones take 1.5 to three years (depending on species) to mature after pollination, with actual fertilization delayed one year. At maturity the cones are between three and 60 centimeters (one to 24 inches) long. Each cone has numerous spirally arranged scales, with two seeds on each fertile scale; the scales at the base and tip of the cone are small and sterile, without seeds. The seeds are mostly small and winged, and are anemophilous (wind-dispersed), but some are larger and have only a vestigial wing, and are dispersed by birds or mammals. 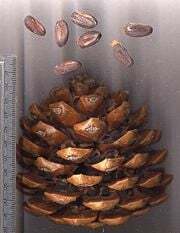 In others, the fire climax pines, the seeds are stored in closed ("serotinous") cones for many years until a forest fire kills the parent tree; the cones are also opened by the heat and the stored seeds are then released in huge numbers to re-populate the burnt ground. Scots Pine branch with young shoots, Estonia. Subgenus Strobus (white or soft pines). Cone scale without a sealing band. Umbo terminal. Seedwings adnate. One fibrovascular bundle per leaf. Subgenus Ducampopinus (pinyon, lacebark and bristlecone pines). Cone scale without a sealing band. Umbo dorsal. Seedwings articulate. One fibrovascular bundle per leaf. Subgenus Pinus (yellow or hard pines). Cone scale with a sealing band. Umbo dorsal. Seedwings articulate. Two fibrovascular bundles per leaf. The Stone Pine (Pinus pinea) was named by Carolus Linnaeus as the "pine of pines" (Peterson 1980). It is probably native to the Iberian Peninsula (Spain and Portugal) but was spread by man since prehistoric times throughout the Mediterranean region. Its large seeds (about two centimeters/0.8 inches long) were a valuable food crop. The "stone" in its name refers to the seeds. Besides being eaten by human beings, stone pine seeds are also eaten by birds and mammals, especially the azure-winged magpie. A symbiotic relationship exists between the trees and the animals in which both benefit because the animals bury some of the seeds for future use. Many are never dug up and sprout and grow new trees. The animals get a steady food source and the trees have a way to disperse their seeds far more widely than they otherwise would. These same types of relationships exist between many species of pines and animals around the world. Squirrels and their relatives, and members of the crow family such as jays and magpies, are the most common animal partners (Pielou 1988). Stone Pines are still valued by humans for their seeds but now more are grown as ornamentals. They are often grown in containers as bonsai trees and living Christmas trees. The Scots Pine (Pinus sylvestris) has the widest distribution of any pine, growing wild across northern Europe and Asia from the Atlantic Ocean to the Pacific Ocean. It grows well in a wide range of soils and conditions and is reclaiming (or being replanted in) areas where its forests had been cut down in the past. It is the most important tree for timber in Europe, producing very good quality wood for many construction purposes (Dallimore 1966). Scots Pine has also been widely planted in New Zealand and much of the colder regions of North America; it is listed as an invasive species in some areas there, including Ontario in Canada and Wisconsin in the United States. In the United States, many Scots pines are grown on Christmas tree farms. The Japanese Red Pine (Pinus densiflora) has a home range that includes Japan, Korea, northeastern China, and the extreme southeast of Russia. It is closely related to the Scots Pine and like it is of medium height (mostly under 35 meters/115 feet). It is the most common tree in Japan and is the most important source of timber there. It is also admired for its beauty in traditional Japanese gardens and as a bonsai tree (Dallimore 1966). 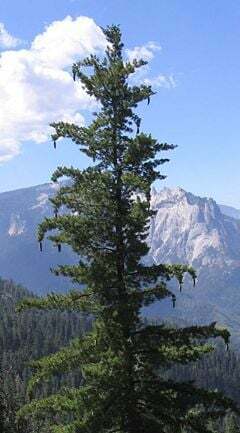 The sugar pine (Pinus lambertiana) is the largest pine, commonly growing 40-60 meters (130-200 feet) tall and sometimes as tall as 80 meters (260 feet) or even more. It also has the largest cones of any conifer, up to 66 centimeters (26 inches) long. It grows in the western parts of the United States and Mexico, mainly in higher elevations. The sugar pine has been severely affected by the White Pine Blister Rust (Cronartium ribicola), a fungus that was accidentally introduced from Europe in 1909. A high proportion of the sugar pine has been killed by the blister rust, particularly in the northern part of the species' range (further south in central and southern California, the summers are too dry for the disease to spread easily). The rust has also destroyed much of the western white pine and whitebark pine outside of California. The United States Forest Service has a program for developing rust-resistant sugar pine and western white pine. Seedlings of these trees have been introduced into the wild. The Great Basin bristlecone pine (Pinus longaeva) is the longest lived of all living things on earth today. The oldest living Pinus longaeva currently grows in the White-Inyo mountain range of California and has been given the name "Methuselah"; in 2006, it was 4,767 years old, over a thousand years older than any other tree (Miller 2006). The Great Basin bristlecone pine grows only in a few mountain ranges in eastern California, Utah, and Nevada and only at high elevations of 2,600-3,550 meters (8,500-11,650 feet) (Lanner 1999). Besides the tree itself, its leaves show the longest persistence of any plant, with some remaining green for 45 years (Ewers & Schmid 1981). The growth rings of Great Basin bristlecone pines have been studied as a way of dating objects from the past and to study past climate changes. By studying both living and dead trees, a continuous record has been established going back ten thousand years, which is the end of the last ice age. In 1964, a tree in Nevada 4,862 years old (older than "Methuselah") was cut down in the process of growth ring study (dendrochronology) due to a misunderstanding. The protests that followed led to a greater concern for the trees' protection, which contributed to the establishment of Great Basin National Park in 1986. The tree that was cut down had been named "Prometheus" (Miller 2006). Pinus radiata is known in English as Monterey pine in some parts of the world (mainly in the United States, Canada and the British Isles), and Radiata pine in others (primarily Australia, New Zealand, and Chile). It is native to coastal California in three very limited areas and also to two islands off the coast of Mexico. In its native range, it is threatened by disease and on one island by feral goats. However, it has been transplanted to other areas of the world which have similar climates to coastal California, especially in the Southern Hemisphere where pines are not native. There it is grown for timber and pulpwood on plantations, which in 1999 totaled over ten million acres, about one thousand times the area of its natural range (Lanner 1999). Eastern white pine (Pinus strobus) is native to eastern North America, occurring from Newfoundland west to Minnesota and southeasternmost Manitoba, and south along the Appalachian Mountains to the extreme north of Georgia (in the United States). It is one of the most important timber trees in eastern North America, with many now being grown on plantations. Eastern white pine is the tallest tree in eastern North America. In natural pre-colonial stands, it grew to about 70 meters (230 feet) tall, but current trees typically reach 30-50 meters (100 to 160 feet) tall with a diameter of 1-1.6 meters (three to five feet). White pine forests originally covered much of northeastern North America, though few of the original trees remain untouched by the extensive logging operations in the 1700s and 1800s. One survivor is a specimen known as the "Boogerman Pine" in the Cataloochee Valley, Great Smoky Mountains National Park. This tree is, at 56.5 meters (185 feet) tall, the tallest tree in North America east of the Rocky Mountains. Before it lost its top in Hurricane Opal in October 1995, it was 63 meters (207 feet) tall. Eastern white pine is the provincial tree of Ontario, Canada, and the state tree of Maine and Michigan and its "pine cone and tassel" is the "state flower" of Maine. 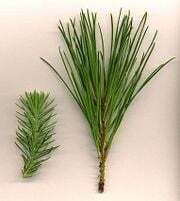 Sprigs of eastern white pine were worn as badges as a symbol of Vermont identity during the Vermont Republic (1777-1791) and appears in a stained glass window at the Vermont State House, on the flag of Vermont, and the naval ensign of the Commonwealth of Massachusetts. In addition, this tree is known to the Haudenosaunee Native Americans as the "Tree of Great Peace." Pines are commercially among the most important of species used for timber in temperate regions of the world. Many are grown as a source of wood pulp for paper manufacture. Some factors are that they are fast-growing softwoods that can be planted in relatively dense stands and because their acidic decaying needles may inhibit the growth of other competing plants in the cropping areas. The fact that, in most species used for timber, most of the wood is concentrated in the trunk rather than the branches also makes them easier to harvest and process (Dallimore 1966). The resin of some species is important as the source of turpentine. Some pines are used for Christmas trees, and pine cones are also widely used for Christmas decorations. Many pines are also very attractive ornamental trees planted in parks, large gardens, and so forth. A large number of dwarf cultivars have been selected, suitable for planting in smaller gardens. Pinetums (or pineta) botanical gardens, especially dedicated to various pines, were first established in England and the United States in the 1800s. Some are also research centers to develop new varieties and hybrids (Peterson 1980). The seeds of some pines are a good food source and have been important especially in the Mediterranean region and in southwestern North America. The inner bark of many pine trees can also be eaten, mostly in times of famine or emergency. Tea can be brewed from the needles. Both are good sources of Vitamins A and C.
Dallimore, W., and A. B. Jackson. Revised by S. G. Harrison. 1967. A Handbook of Coniferae and Ginkgoaceae. New York: St. Martin's Press. Ewers, F. W., and R. Schmid. 1981. “Longevity of needle fascicles of Pinus longaeva (Bristlecone Pine) and other North American pines.” Oecologia 51: 107-115. Little, E. L., Jr., and W. B. Critchfield. 1969. Subdivisions of the Genus Pinus (Pines). U.S. Department of Agriculture Misc. Publ. 1144 (Superintendent of Documents Number: A 1.38:1144). Lovett, R. 2006. The Lovett Pinetum Charitable Foundation. Miller, L. 2006 The Ancient Bristlecone Pine. Mirov, N. T. 1967. The Genus Pinus. New York: Ronald Press. This page was last modified on 29 August 2008, at 15:13.